A large dust storm has hit western parts of the Middle East, putting dozens of people in hospital and leading to public health warnings. 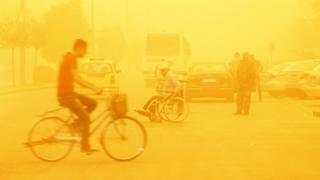 After hitting parts of Syria on Monday, the dust spread to larger areas of the country on Tuesday morning. Parts of Lebanon, Israel, Turkey and Cyprus were also affected. Lebanon's state news agency said two people died - one an elderly man found on a roof. Syrian media said the weather stopped fighting in Hama and Idlib provinces. The pro-government al-Watan newspaper said (in Arabic) that government helicopters were prevented from flying because of the dust. The poor weather was down partly to a low-pressure system over the entire region and sand blowing in from the east, Syria's state news agency, Sana, said (in Arabic). Poor visibility may last until the end of the week, it added. at least 10 people have been taken to hospital in Cyprus with breathing difficulties. BBC correspondents across the Middle East have also been posting images of the sandstorm on social media.